We’ve all encountered the “offline” page in Google’s Chrome browser. This happens when you aren’t connected to the internet and are trying to load a website. The mascot representing this offline page is a pixelated dinosaur. You can even activate a hidden game which is an endless runner with the goal of avoiding running into cactus plants. It’s just a fun bit of using Google. Well, if you like that dinosaur, Dead Zebra has brought the dinosaur to life as a toy. 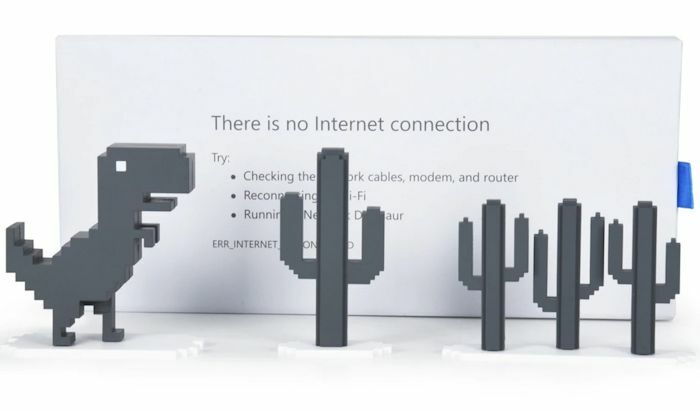 Users can purchase the pixelated T-Rex and the cacti along with a backdrop depicting Chrome’s offline page. The dinosaur set will be priced at $24 and will be available for purchase starting on March 11, 2019. I’ll have to get one of these for myself. We don’t know if this will be a limited edition item or not so you better buy this toy while you still can.